Cards: Topps 1982, Fleer 1990, Proset 1990, Proset 1991. Drew Hill is a receiver who has gotten no respect. 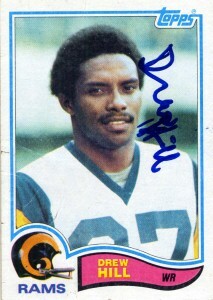 Barely a blip went by when in the 12th round the speedster out of Georgia Tech was selected by the Rams in the 1979 draft. 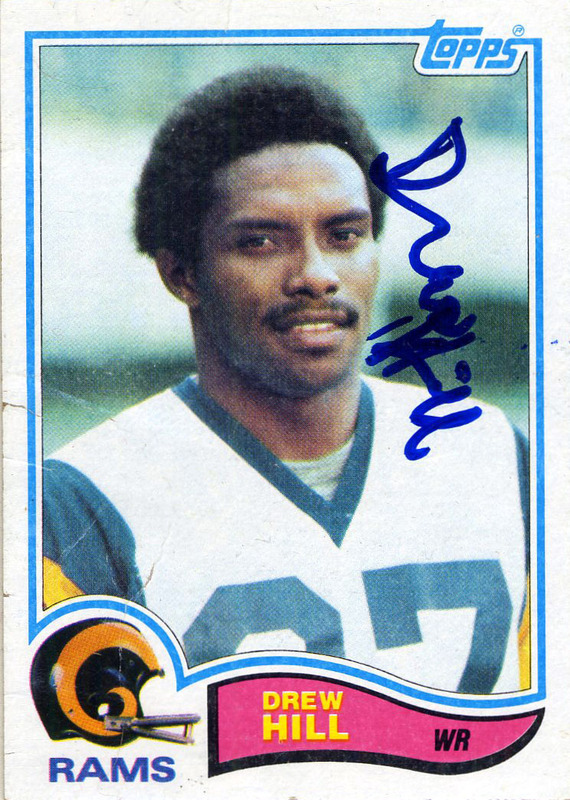 In the beginning of his career the LA Rams used Hill primarily as a kick returner. By his final season with LA in 1984 Drew would finally be getting some credit as a receiver pulling down a monstrous 27.9 yards per catch on 14 receptions. 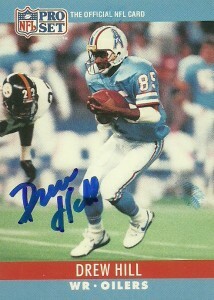 Hill was traded to the very bad Houston Oilers squad in 1985 and immediately started paying dividends as Warren Moon‘s primary receiver. Over the course of the next 7 years Hill grabbed 634 receptions and 7477 yards and stretched defensive secondaries to their limit, averaging an electrifying 15.5 yards per catch, including a 20.2 yard average on 49 receptions in 1987. He went to the ProBowl in 1988 and 1990 and tied Haywood Jeffires for the AFC lead in receptions with 72 catches. 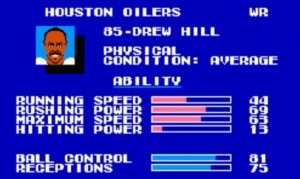 In 1992 the Oilers let Drew go via free agency. The knock on him was that he was too old at 36. He signed with his homestate Falcons, being reunited with former Oiler coach Jerry Glanville and put over 1000 yards into his Falcon career, retiring after the 1993 season as an Atlanta Falcon. Hill at the time of his departure from the Oilers was the all time leader in catches and yards, and second in touchdowns. 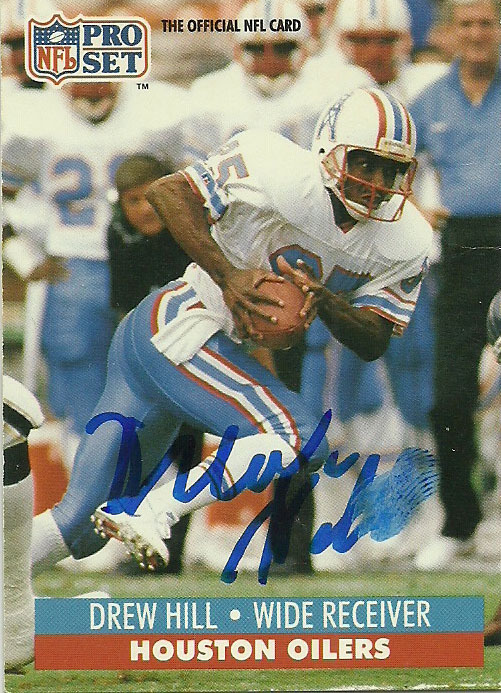 He averaged an amazing 70.5 yards per game with the Oilers. (Since then his records were broken by Haywood Jeffires and Ernest Givins.) 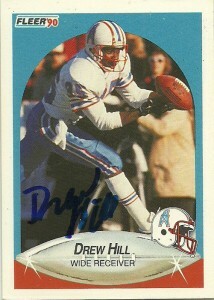 Among Drew Hill’s lesser known accomplishments is that he is the first person to score a touchdown in the 70’s, 80’s and 90’s beating HoF member James Lofton by a game and ironically (to Bud Adams chagrin,) he was the first player to notch four 1,000 yard seasons after the age of 30. Drew since retirement has returned to his Georgia roots where he lives in relative anonymity. I sent for his autograph TTM after locating his address on another site. I did a bit of research on him and was dismayed that somebody with the same name had been posing as him claiming to be a fine artist. When Drew wrote back, he informed me that the artist “wasn’t me.” Although slightly embarrassing to me, I hope it called attention to him that there was somebody out there usurping his good name. I got Drew’s autograph after training camp in 1990 one day where he was thoroughly exhausted. He was a really nice guy, but of few words. His autograph felt like his personality (understated) and I really wanted to get it again when I decided to mail out to some of my favorite Oilers earlier this year. I was really angry when the team let him go via free agency and felt when they did it exposed a chink in the team’s armor. Amused, Jerry tracked me down, and contacted me for an interview since I was living locally in the area so that he could have ‘more ammo’ for his talk with the artist inmate. We discussed my brief involvement in the situation, how I had been in touch with the ‘real’ Drew Hill via the mail, and that Jerry had indeed spoken to and interviewed ‘the real’ Drew Hill in Georgia. He said that he may use my information in a further interview with the inmate and was amazed by what a small world this was with the coincidental timing of the situation, my post and the fact I lived in the greater LA area, but none of this unfortunately ever made the article and thusly I get no props for my super ‘sleuthiness’. You can read the article in its entirety here. A second article is a follow-up from the Santa Monica Daily Press, where the original call for help was issued for the impostor. On Thursday March 17th, 2011, Drew was golfing and fell ill. Although he was transported to the hospital shortly thereafter, Hill suffered two strokes and passed away on March 18th, 2011. He was 54. It should be noted that the Associated Press even got some of his information wrong, stating not only the wrong date on his All Pro seasons, but also that he was an artist, – a claim that he disputed when I sent him mail last year.